The Giant Colon exhibit was present at the Salon Ma Santé event at Complexe Desjardins on April 10th and 11th to promote screening and awareness for colorectal cancer. Over 8,000 visitors entered the exhibit during the two days of the event to learn about nine different colon pathologies and to listen to a presentation on cancer prevention by our resident muppet scholar, Dr. Preventino. CCAC staff were on site to answer questions from hundreds of keen visitors and to distribute educational material about colorectal cancer facts, screening, and symptoms. Numerous visitors stated that their experience at the 40ft long, 8ft tall exhibit helped to eliminate any reservations they had about speaking with their doctor about colorectal cancer and obtaining a colonoscopy. Partners of the Giant Colon present at the event included Warnex Laboratories, Dairy Farmers of Canada, the Greater Montreal Foundation and the Opmedic clinic. The CCAC hopes that this wildly successful event will continue in future years to raise awareness about colorectal cancer among thousands of Montrealers. 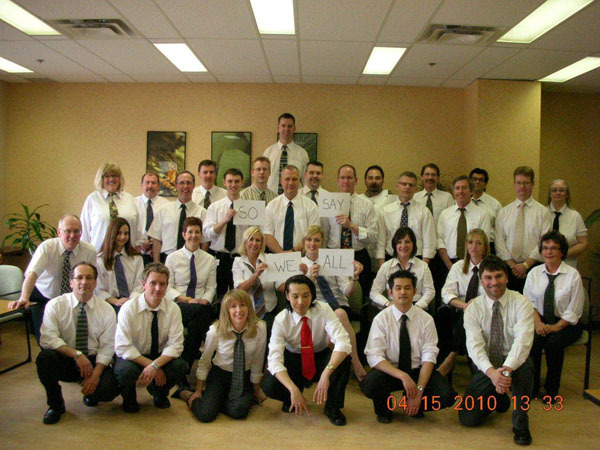 The first annual White Shirt and Tie Day was organized by Lisa Churchward and took place on April 13, 2012.